Orange Beach Home with Beautiful Views, Completely Remodeled, Large Decks, Pool, Beach, Tennis, 7 Bedrooms! We loved this place an plan to stay here from now on if its available. We enjoyed our 5 night stay at Romar Place unit 503. It was roomy, had comfortable beds, nice living room furniture for relaxing. The view was amazing! The indoor pool and spa were amazing too. The bedrooms were nice and roomy. The kitchen was good for cooking and had what we needed for the week. We would stay here again for sure. Family-friendly. The condo itself and the location top notch. This cute condo was perfect for our group of 7 people. It was so tidy and cute and its close to the stores, restaurants and activities. The view is incredible and the beach is glorious. Owner has a Very convenient wagon stocked with chairs so dragging our stuff to the beach was a breeze. We would stay again for sure. We were very impressed with condo and location. It has a great view from balcony, the furniture and decor was great and it was fully stocked with all accessories. On our second day we woke up to construction on the property. We contacted the management company and they were quick to relocate us to another property. We had a great experience and were very impressed with both properties and our experience. We would definitely rent from them again and visit Orange Beach again. This condo is right on the beach with everything you need. Close enough to walk most anywhere you want. Great views. Well kept. Received a call prior to our trip that for our short stay, there was potential for improvement work to affect our view. Thus, the owners asked to relocate us. We agreed. It was essentially an equivalent property, but the amenities were less than what we had anticipated. This was the only detractor in an otherwise fantastic visit to the shore. We did very much enjoy the alternative lodging however. I would stay with Alabama Getaways again. Everything was perfect! The pictures are exactly what it looks like in person. Very clean, Plenty room for our family! The condo was very nice and very well appointed. The unit was clean and Beds were comfortable . The only negative was the shower heads need to be changed out. Overall an amazing week. Would stay there again! Perfect location to beach and things to do. Hot tub on the patio was a nightly routine for all our kids! It was so nice to have a kitchen with so many utensils and pots/pans to cook meals. We would rent this property again! Easy check in, the condo was beautiful, would definitely stay here again. I enjoyed every minute of my stay..
We really enjoyed, everything was very clean and decorated beautifully! Condo was wonderful, fully stocked! Balcony has lots of comfy places to sit and read a book, play games or have a meal. This condo provides beach chairs, toys, umbrellas, boogie boards and a wagon to carry it all in. Kitchen more than adequate - I cooked several meals. Have stayed at seawinds before, all through Alabama Getaway and have never been disappointed. Was our first time in this particular condo and would absolutely stay in it again! Totally recommend! Loved this property and condo. Great location, kids loved the pools and lazy river. Short walk to beach. The only downfall is the weak cell signal in the building. We would definitely stay here again. This condo has amazing views of the ocean and bay from every room. With2 adults and 3 teens, it was comfortable and met all of our needs. The hot tub and indoor pool were great for cooler evenings, as well as the pool tables and fooseball. I highly recommend it! Most comfortable place we have stayed at. Beds are very comfortable, beautifully decorated and clean. Great location, immaculate, everything we were hoping it would be! Couldnt have been nicer. It looked like they had used a really good decorator to me. Although we had cool weather until around 12:00 we enjoyed the indoor pool every morning. We had 4 kids under 9 and cooked quite a bit and found the kitchen well stocked with everything. The beds had great sheets and towels seemed exceptional for a rental. The kids loved the lazy river and slide in pool. Ive rented many condos in my time and would rate this at the top of my list for the amount of money we paid. We will be back and would recommend this condo to anyone I know. Thanks for another great memory in a super comfortable space. 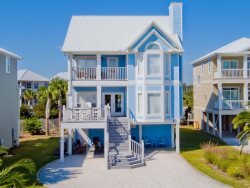 I cannot imagine you could find a better place to stay while in Gulf Shores! The condo itself is in a great location and beautiful! The views are amazing, the decorations are so welcoming, extremely clean, very spacious, and well furnished! And peaceful!! We were there with the Spring Break kids and would not have known it. Highly recommend! We have stayed at Seawind in the past and once again love the LOCATION! This condo complex has an indoor/outdoor pool along with a hot tub outside which is appealing to all ages. Sea & Suds is connected to condo and several restaurants / bars are within walking distance. Our family found RITA's Italian ice last year and have to rave on the owner Deb, they also just opened a Tiki boutique (this week)at the same location which has clothing and beachy attire. Condo #509 is an end unit and was decorated perfect! There was the beach theme in every room. The area is perfect for families and people that want to enjoy the beach without the college party atmosphere. We will be back next year!!! Very comfortable for our family of four adults and four young children. We spent the weekend in this wonderful rental. Great location with an amazing view. The rental agency, Alabama Getaway, was easy to communicate with via text messaging - smooth check-in and check-out. Enjoyed our time at this lovely rental.